Almost everybody who has been to China recently comes back highly impressed with their development. The frenzied pace of construction activity in Beijing, the infrastructure development for 2008 Olympics Games and the general cleanliness of the city is highly impressive even though China still continues to call itself a developing country! Beijing looks like any other modern European or American city. Even the air pollution on a cold November day was comparable to that in any American or European city. Similar is the story in other cities like Shanghai, Tianjin, Chongqing, etc. Yet with all the impressive urban revival of China the rural areas are in pretty poor condition and the urban - rural divide both economically and socially is increasing day by day. This chasm is leading to large-scale social unrest in rural areas and migration of large populations to urban areas. Recently the episodes of farmers being evicted from their lands and the land given to industries and builders has created further unrest. The Chinese authorities are very concerned about it and feel that to contain this rural unrest it is necessary to create suitable infrastructure in rural areas so that the fruits of rapid growth in economy are also available to populations there. One of the ways to do it is to provide modern energy to these areas. The Chinese government claims that only 8% of the rural population has no electricity. Contrast this with the number of 60% rural population in India which is without electricity. This and other numbers regarding the indicators of rural poverty in China are very suspect and generally the government of China does not readily come forth with numbers which show the state in bad light. This has always been the case with Chinese statistics. However the anecdotal evidence and ground realities reported by rural workers suggest that the situation maybe quite alarming thus necessitating the setting up of a very high powered group called Office of National Energy Leading Group (ONELG) under the chairmanship of Prime Minister Wen Jiabo. ONELG has been charged with the development of the energy policy of China and rural energy forms a very major part of this policy. 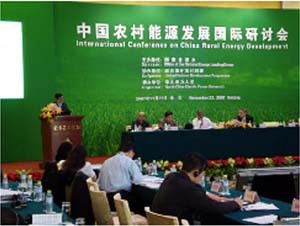 Chinese also want to learn about rural energy strategy from the experiences of the countries round the world. Hence a one day high level symposium was organized by ONELG together with United Nations Development Program (UNDP) in Beijing in November. Five international experts from Brazil, Zimbabwe, Bolivia, South Africa and India (this author) were invited to advice and share their experiences with the Chinese rural energy experts and senior government officials. The conference was inaugurated by Mr. Xu Ding Ming the energy czar of China and Vice Chairman of ONELG. There is a great lesson to be learned from this for India. Firstly the need to learn from international experiences and secondly to follow the advice of experts. In India most of the time advice from experts is ignored either due to political exigencies or just the laziness in not doing due diligence. Though India was the first country in the world to set up a Ministry of Non-conventional Energy Sources in 1990s, the record in this area is quite dismal. Anecdotal evidence also suggests that Chinese authorities are worried that the present rate of stupendous economic growth may get a jolt if there is social unrest in rural areas since they supply the cheap labor for the industries. But whatever may be the reason once the Chinese authorities decide to do something then they do it ruthlessly.